Mushrooms generally spring up after a summer rain. Around our house, Christmas is the season for a mushroom explosion. 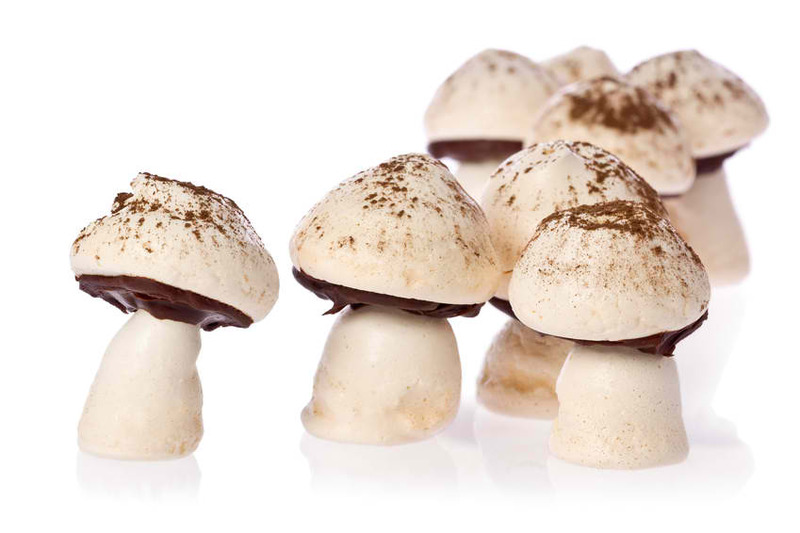 Over 30 years ago, I noticed a recipe for meringue mushrooms, traditionally made to accompany that classic Christmas dessert, a Buche de Noel. I have been making them ever since in vast quantities to enjoy, share with friends, and to fill a huge basket for an annual party we have which has now become known as “The Mushroom Party”. Make lots of these on a dry day. They will keep well in an airtight container for a week or two. Beat egg whites until foamy. Beat in salt and cream of tartar. Continue beating while adding sugar gradually. Add almond and vanilla extracts. Beat at high speed until meringue is very stiff, about 4 minutes, depending upon your mixer. 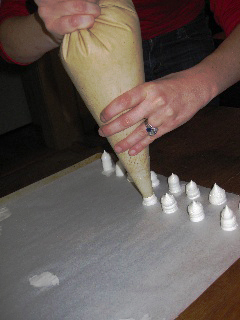 Place meringue in a large pastry bag fitted with a plain 1/2 inch tip. Line two large cookie sheets with parchment paper. 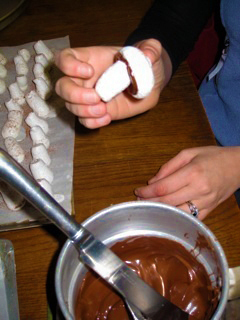 Make the stems first, while the meringue is very stiff. Squeeze bag while lifting to create 1/2 -3/4 inch stems. 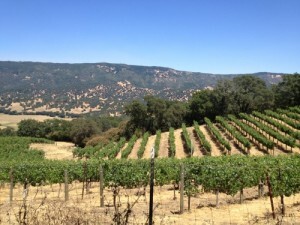 Use the same technique for the caps, but do not lift the bag as quickly. The stems should be about 1″ in diameter. Try to keep them high and puffy, rather than flat. Next, take a cup of very cold ice water and dab the stems and caps with your damp finger to flatten out any points. Use as little water as possible so the meringues don’t get sticky. Finally, dust the stems and caps with cocoa powder in a small sieve. 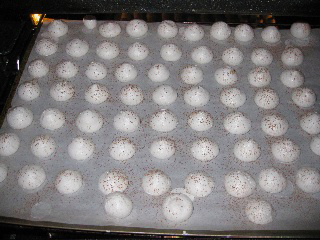 Bake the meringues in a preheated 225 degree oven for one hour without opening the door. 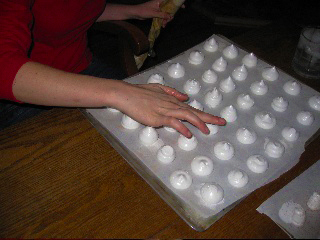 After one hour, check to see if the meringues can be easily lifted off the parchment. 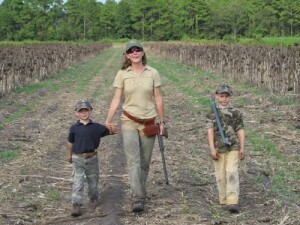 If they can, they are done. Turn off the oven and leave the meringues for several hours or even overnight. 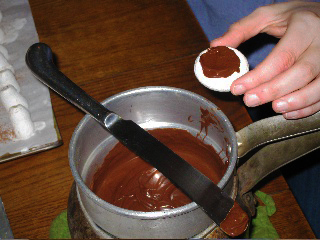 Melt the chocolate and spread a dab of chocolate on the underside of the mushroom cap. Glue a stem to the cap and place on a tray to dry in a cool place until the chocolate hardens.